A UCT chemist will have the opportunity to pick some of the most brilliant scientific minds in her field when she attends an annual meeting with Nobel Laureates in Europe next week. 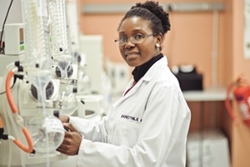 Dr Banothile Makhubela (29) will be part of a select group of young scientists congregating in Lindau, Germany, for the 63rd Nobel Laureate Meeting on Chemistry. This year, 35 Nobel Laureates will attend the meeting from 30 June to 5 July. Makhubela has also been selected to participate later this year in the 2013 SciFinder® Future Leaders in Chemistry programme, which will give her insight into the inner workings of the largest database of chemistry and related science information. The main topics of the Nobel Laureate meeting, green chemistry and biochemical processes, are right up Makhubela’s street. Her area of interest is organometallic chemistry – a chemical science that lies at the interface of inorganic and organic chemistry. This research field has applications in biomedicines, catalysis and green chemistry. When asked where her interest in chemistry comes from, she answers that she found chemistry “more understandable” than any of her other subjects at school. “This later on developed into an interest in inorganic chemistry, specifically reactions involving transition metals in organic species,” she adds. Makhubela hails from Mzinti, a town in rural Mpumalanga. She completed her undergraduate degree at the University of Zululand and chose UCT for her postgraduate studies. She describes the moment she learnt about her selection for the Lindau meeting as “very exciting and a proud moment”. She looks forward most to interacting with Robert Grubbs. Grubbs was one of the 2005 chemistry prize winners, whose area of research, like Makhubela’s, is bio-inorganic chemistry. She hopes that the mentorship resulting from the Lindau meeting will inspire her and other African participants “to develop scientific tools to meet the developmental challenges” in Africa. Dr Gregory Smith, under whose supervision Makhubela completed her doctorate, describes her as “an excellent student”. He adds that she is “certainly one of the top research students in our department”. The feedback from her application to participate in the 2013 SciFinder® Future Leaders in Chemistry programme was equally commendable: “Your exceptional essay, letter of recommendation and CV demonstrate a commitment to research and appreciation of chemical information, and distinguished you among hundreds of applicants this year”.